The “RockUp-’17″ is one of the few “updates”. I did of older models for this new year. Based mainly off of rider and customer feedback, as well as our burgeoning business in Bali, where we needed a funtioning flowing set of sizes for the shops there who actually stock step up boards in the retail racks. It felt like every custom order I was getting for Rock-Ups, required some time and tweaking to the files. Instead of repeatedly changing each custom order, i went though and re-built the Rock-Up “master files” and fine tuned the stock dims. Our old Rock Up files were pretty dated, considering we first released the model, in 2010, on the back of Chris Wards request for a shorter tube riding specialty board, we actually featured Ward on the cover of our 2010 catalog, riding a 5’8” Rock-Up (made in XTR construction) in Indonesia. The newest version features looks less “Gunny”, and in fact a bit closer to the “Round-Up” But a closer look will reveal subtle differences. The stock dims on these are significantly more slight as they are on the Round up. The tail outline, although more full than before, is still more pulled than the Round-Up, and they have more overall rocker, with less concave running through it. The combo of increased rocker and less concave reduces lift and allows greater control in, and around the tube. 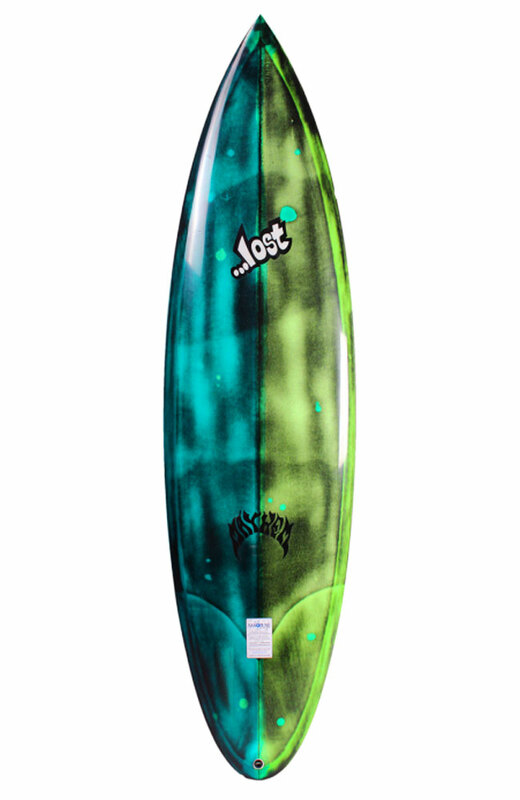 They will react to more subtle nuances and allow more precise positioning, when riding powerful, hollow surf. The slightly more generous outline in the rear 18” of the tail, adds some area under foot, and frees up the board a bit, encouraging a more hot doggy and high performance approach to heavy waves. We wanted to up the surfer and enable them still do some radical turns, when the section allows. If a Rocket (or other hybrid) has become your favorite daily board, and you find it frustrating switching back to a traditional, pointy nose step-up board on bigger, crowded days …then this board is for you. Designed to be ridden 2-4” longer than you would a Rocket. The low entry rocker, flat deck and tapered rails (with a full forward outline) paddles through crowds and moving water, and catches waves with ease. The pulled in tail, combined with the aggressive tail rocker and a smoother, shallower concave, allows controlled maneuvers at high speeds on waves up to double overhead waves.